Police arrested 32-year-old transient Drew Wohlenhaus in Isla Vista on Friday for battery and attempted murder of a police officer. At approximately 2 p.m., Isla Vista Foot Patrol (IVFP) deputies were approaching members of the transient community to inform them of shelter resources before the impending storm, according to Kelly Hoover, Santa Barbara County Sheriff’s Office (SBSO) spokesperson. Officers approached Wohlenhaus in Pelican Park on the 6500 block of Del Playa Drive about littering in the park. Wohlenhaus refused to identify himself so officers could give him a citation. He then became “agitated,” according to a press release sent out by SBSO. According to the release, Wohlenhaus refused to cooperate with officers and attempted to walk away. When deputies attempted to restrain him, he became combative and tackled one of the deputies. In the ensuing struggle, Wohlenhaus bit one deputy on the shoulder, and kicked another in the face, Hoover said. He also “forcefully” attempted to remove a deputies gun from their holster. At this point, he was tasered. 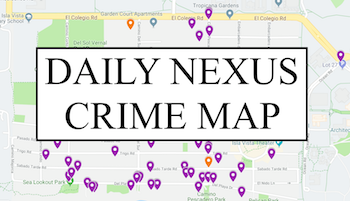 While being arrested, Wohlenhaus claimed to spectators that deputies had been the ones to tackle him and admitted to the biting and reaching for the gun, according a Nexus reporter who was at the scene. The deputies did not require medical attention. Wohlenhaus was uninjured and declined medical attention. At the time of his arrest, Wohlenhaus called out to spectators that he had been making clothing when the police approached him, suggesting that his designs were the cause of his arrest, according to the Nexus reporter. “When you start making really epic clothing, these guys may be actors, for all you know,” he said. A mental health request has been made, Hoover said in the press release. The video of part of the incident can be viewed here. 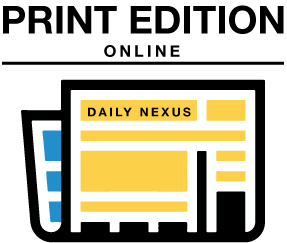 Tamari Dzotsenidze is the managing editor at the Daily Nexus and can be reached at managing@dailynexus.com or news@dailynexus.com. Transient? Seriously? Just say “homeless person.” He’s a human being for Christ’s sake. Dude belongs in a hospital, not a jail. true. I know this person. He really needs some help. Why are police restraining people over wanting to give them a littering citation??? This dude kind of looks like a long-haired Tucker Carlson. Doesn’t look a thing like him, but thanks for pushing your agenda. Another crazed caucasian trying to kill people. We should send them back to Europe.